There are many innovative medical device firms that set the bar high for innovation and Aspen is honored to be recognized among them. In addition, the awards received have highlighted areas of the company that we are very proud of including design and innovation, company culture and entrepreneurial spirit. They have also reinforced Aspen’s approach to creative patient-driven solutions and business practices that stand the test of time. This is very important to Aspen as a company committed to serving our customers and working together to strive for the best patient outcomes. 2017 OC Business Journal: Best Places to Work in California. 2017 Cascade Supplier of the Year. 2017 Vizient Award: Innovative Technology Designation — Peak Scoliosis Bracing System™. 2017 Ernst & Young Entrepreneurial Award: Winner in Healthcare and Community Category, Orange County Region — Dan Williamson, Aspen Founder & CEO. 2016 Hanger/SPS Operational Performance Award. 2016 Cascade Supplier of the Year. 2015 Hanger/SPS Rising Star Award. 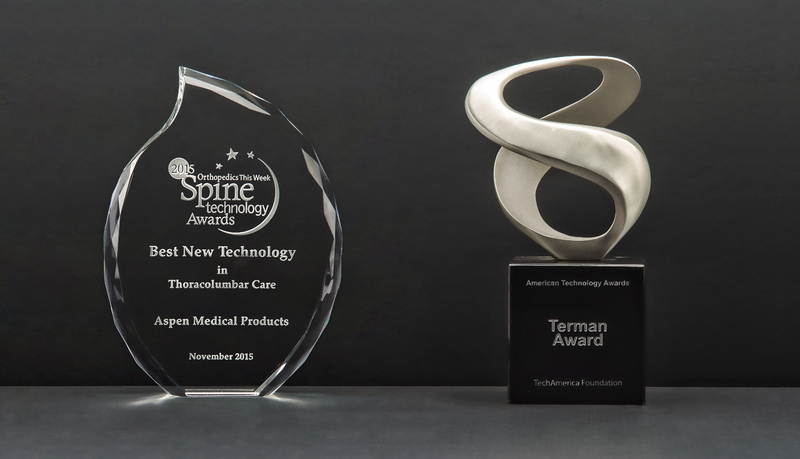 2015 Orthopedics This Week: Spine Technology Award for Throacolumbar Care – Peak Scoliosis Bracing System™. 2010 Orthopedics This Week: Best New Technology for Spine Care — Vista® CTO. 2010 TechAmerica Foundation’s Terman Award: Innovator Award for Medical Devices Category — Vista® Cervical Collar. 2009 Orthopedics This Week: Best New Technology in Spine Care — Vista® Cervical Collar. 2009-2015 OC Business Journal: Best Places to Work in California. 2008 Employers Group: Best Places to Work in California. 2007 Employers Group: California’s Best Places to Work. The Orange county Best Places to Work is brought together by the Orange County Business Journal and Best Companies Group. The survey and recognition publication are dedicated to identifying and recognizing California’s best employers in Orange County. Presented annually, this award recognizes superior standards for delivery of products to Cascade, an industry leading O&P Distributor. Each supplier is ranked using a complex evaluation tool that measures factors including “On-time Delivery, Post-Sales Support, Return Percentage Rate, Lead Times and Backorder Occurrence, Complexity of Product Mix and Customer Service”. The E&Y Entrepreneurial Award program recognizes entrepreneurs who are excelling in areas such as innovation, financial performance and personal commitment to their businesses and communities. They seek entrepreneurs whose boldness drives them to do things differently and change our world in the most unexpected ways through new ways of thinking, disruptive business models and overall dynamism that makes this country a great place to do business. One winner is selected per category for each region who then becomes a finalist for the national award. Presented during the annual Hanger Education Fair, the Operational Performance Award recognizes partners who outperform in efficiency, clinical acceptance, cost reduction or increase in revenue. Presented during the annual Hanger Education Fair, the Rising Star Award is earned by a partner who has exhibited the greatest improvement and is driving industry change. Presented by Orthopedics This Week and RRY Publications LLC, the Spine Technology Awards focus on “Celebrating Excellence and Innovation in Spine Surgery Products.” These annual awards are designed to bring increased recognition to exemplary and innovative spine surgery products and the engineering teams and inventors who create them. Judging is based on originality, clinical relevance, and the likelihood that the technology will improve current standards of care. The American Technology Awards states that they bestow the only “Best Of” awards that recognize all technology products and services for the technology industry. One winner is selected in each category: Clean Tech/Green Tech/Smart Grid; Cloud Computing; Cyber Security; Internet; Medical Devices; Server and Storage Technology; Software; and Telecommunications. Nominations for American Technology Awards, “The Termans”, are vetted by industry experts and technology companies. These awards have been named after Frederick Terman, who is widely credited as being the father of Silicon Valley. Vizient suppliers showcase their innovative medical product or technology to over 2,000 clinicians and healthcare industry leaders at the annual Vizient Innovative Technology Exchange. Based on direct feedback from Vizient-served members, Innovative Technology designations are awarded during this event.